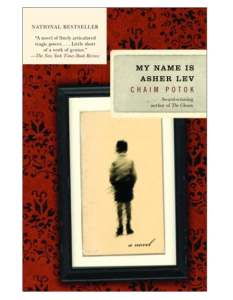 Chaim Potok’s Orthodox Jewish background comes through vividly in My Name Is Asher Lev and its sequel The Gift of Asher Lev. Asher has a tender heart towards “the Master of the Universe,” but he also has an unquenchable passion to make art, despite the disapproval of his parents and Hasidic Jewish community. The result is a painful struggle to reconcile his religious and artistic identities. As he studies the Western canon of great art, Asher becomes preoccupied with crucifixes. Like Chagall in real life, he identifies with the suffering of Christ. He eventually uses the symbol of crucifixion to express the suffering of his mother. Word as a multi-faceted jewel with the acknowledgment that out of all the peoples of the world, God chose to reveal himself to the Jews first. “Scroll Dance” is expressive calligraphy in gouache with gold and platinum leaf by Timothy R. Botts.